After the letdown that was the MkIV Golf GTI, Wolfsburg fanboys looked to the 2000 Lupo GTI to redeem some sporting honour. Which it did. VW engineers kept things simple, light and fun. The little Lupe's doors, bonnet and front wings were all made from aluminium. Revised suspension firmed up the ride without ruining it. A deep front spoiler with ducting vents and a central rear spoiler teamed up with a cheeky centralised pair of exhaust tailpipes. Inside, you got unique sports seats, alloy pedals and gearknob and a three-spoke leather steering wheel. Unfortunately. the general public didn’t get it: only 950 Lupo GTIs found UK owners. Today there are 607 GTIs left, giving it exclusivity, collectibility and climbing values. Decent cars at £2k have gone: you'll need twice that today, and over £6k for top examples. The £5295 specimen on test here is a late six-speed example, offered for sale by IGM Pedigree Motors near Macclesfield in Cheshire. A recent import from Japan, it's covered 85,500 miles yet still looks great. There are a few light marks around the car, the most notable of which is a small crease to the passenger end of the rear bumper, but the overall impression is very good. 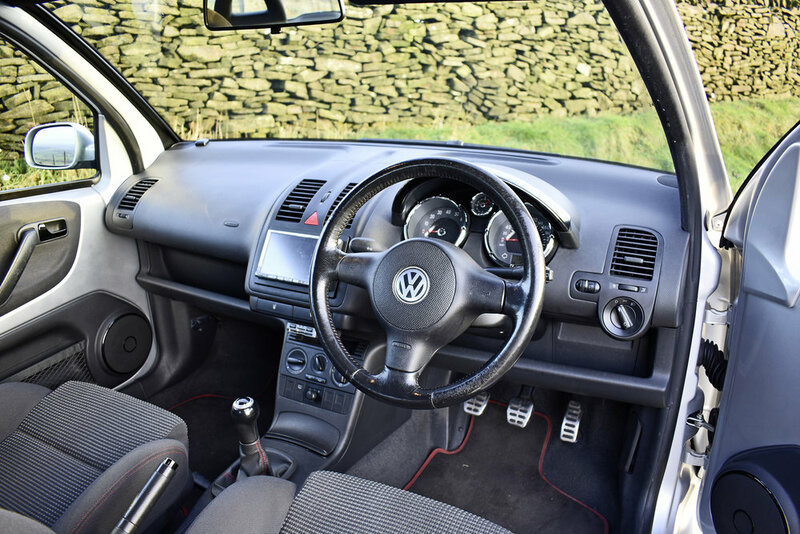 The alloy wheels and ICE system have both been swapped for high-quality aftermarket alternatives, and there’s a little wear to the driver’s seat fabric and to the rim of the leather steering wheel, but otherwise this Lupo belies its age. The engine bay presents very well and all the fluids are the right colour and at the right marks. Despite being only a 1.6, the VW ARC engine has variable-valve inlet timing, making it a willing performer at lower rpm and a raucous top-end blast. Every ratio in the slick, short-throw gearbox is perfectly set up to drop you right into the power band. The fun-filled and grippy drive is reminiscent of a 106 GTI or Saxo VTS. Braking is strong and responsive. An all-too-brief blast around the western fringes of the Peak District left me grinning from ear-to-ear. Unlike those hot Frenchies, there's rattle-free reassurance and rarity. This Lupo drives well, it's economical and is poised to appreciate in value. It's not a hard one to recommend. 1999: Lupo (Latin for Wolf, after VW’s hometown Wolfsburg) is launched to fill the gap left by the now much larger Polo. 2000: The GTI version is added to the Lupo range. Aluminium body panels and the engine from the Polo GTI mean a tiny weight that makes the most of the modest 123bhp. 2002: Five-speed transmission is swapped for a new, slicker six-speed ‘box to help futureproof the Lupo for emissions legislation. Performance figures and top speed remain unchanged. 2005: Production ends when the Lupo’s replacement, the Brazilian-designed and built Fox, is introduced.